HomeStoriesWords of WisdomCan You Relate? The picture accompanying this article was made in front of our house next to our entry porch. If I had taken a picture of this same area two months ago, you would have seen some well-established boxwoods and a holly bush. But life happens…and replacing a field sewer line required a backhoe to scoop those shrubs up in a matter of seconds and carry them away. We are now left with a blank canvas that definitely needs attention. Oh, I can envision how I would like to have the area look: an English flower garden!! — but getting there is another story! You see, I do not have a “green thumb”. I have several friends who are certified Master Gardeners. They are the type of people who can plant a dead-looking stick in the ground, and it starts growing….immediately. I have pursued the elusive green thumb for years! Once I even went so far as to purchase a hardcover book that would guide the reader through an entire year of knowing what to do (and when) in order to have a lovely flower garden…but I still don’t have a lovely flower garden. Don’t get me wrong: I do love flowers, and I can manage to maintain a few containers with petunias or geraniums (something really low-maintenance!!). When I visit the lush, plant-packed and profusely blooming flower gardens of my friends, I so enjoy the beauty of the colors and textures, but at the same time I feel overwhelmed by my lack of knowledge and initiative to achieve anything remotely similar to what I see. I will have to rely on the expertise of others to attain my goal. One thing I have observed among all successful gardeners: they have a relationship with their plants. They talk to them, they “baby” them, they treat them gently with love and respect, and they recognize and meet their needs. Perhaps this is the key to their success…and when you think about it, healthy relationships are the key to a great many successes in life. If I wish to be an effective wife, mother, daughter, employee, and friend then I must be willing to invest the time to keep my relationships healthy, open, and thriving—treating others in the same way successful gardeners treat their plants. 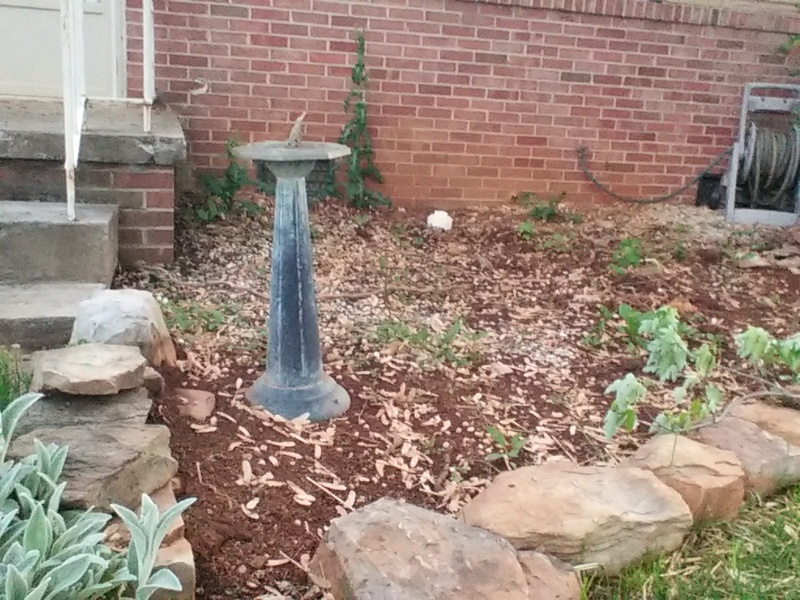 So my future English flower garden calls to me…crying “Help! Help!”. I’m definitely going to have to invest some hard work and time there….a LOT of time!